Intex Ultra Frame Pool Reviews One of the most popular and time-tested above ground pool that has brought joy to a lot of families is the Intex Ultra Frame Pool. Over the years there have been a number of upgrades to the current version of the Intex Ultra Frame Pool. A number of glitches have been taken care of in the current version which in turn creates more satisfied users. Overview One of the primary advantages of this Intex swimming pool is that it is easy to setup and dismantle at the same time. Although the pool can be used all year round (by tempering the water during winter months with above ground pool heater or solar above ground pool covers) yet the life of the pool is largely extended if it is dismantled and stacked away for some time during the year. The components that make up the aboveground pool structure are strong, durable steel frames which are treated with powder coating to prevent rust and wear from extended periods of contact with water. The side walls extend 52 inches in height and are made up of Ultra Strong laminated PVC material for extended longevity from wear and tear. 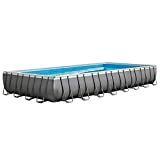 The Intex Ultra Frame Pool is available in either a rectangular version or a circular version with varying sizes for each version. The rectangular version comes in three sizes. How to install above ground pool Usually a couple of hours should be all it takes for two people to setup the installation for a Intex 18 X 9 pool. The time can vary a little more for the other larger variations of the Intex Ultra Frame pool. The products are shipped along with an installation DVD specific to each variant and it is recommended that a step-by-step method be followed without rushing or skipping steps. 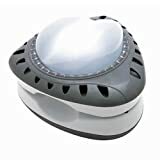 This will ensure a near-perfect installation which will stand the test of time and save you from unwanted headaches in the long run. Probably the most vital point to take heed of is to install the Intex Ultra Frame pool on a plane and level ground preferably one without grass, soft mud or loose sand. 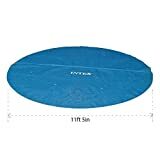 If you are installing the Intex above ground pool on a concrete floor area, make sure to use a rubber cushion mat of reasonable thickness to firmly hold the structure in place. It is recommended that the support stands of the above ground pool be placed on pressure treated wood preferably 15 X 15 X 2 inches in dimension for enhanced stability when placing the Intex Ultra Frame pool in your backyard. At the time of setting up the Intex Ultra Frame Pool one might come across moments of doubt and scepticism with regards to the disproportionate balance of weight and undesired concave curvatures on the sides of the pool. The corner pieces may seem to fit fairly loosely while the pool is being filled up or they may seem to fit so tight that they might snap. Trust me, they are all normal “in-progress” symptoms and once the Intex swimming pool is filled to the brim, you would notice that all discrepancies will disappear giving way to a firm, well-balanced and sturdy structure right in front of your eyes. At the time of the setup, it is advisable to use baby powder on the steel pipes to smooth out their insertion into the vinyl. Be wary of the fact that the actual dimensions taken up when the Intex Ultra Frame above ground pool is fully set up is about 11 inches ( 1 foot approx) more than the dimensions mentioned for each variation. This is because of the fact that the base clip supports extend about a foot more than the actual pool size. Which means that for a 18 X 9 pool, the final setup dimension would be 20 X 11 and likewise for the other variants. After an extensive research we have found out that the above ground pool ladder supplied along with the Intex Ultra Frame pool is rickety and could cause unwanted injuries especially to heavy individuals or people suffering from back injuries. Therefore we recommend you separately review a few above ground pool ladders and base your purchase on that. It is a good idea to review a few saltwater systems that are ideal for the purpose of your pool. All Intex Ultra Frame pools are fitted with dual suction outlets for keeping the water hygienic and crystal clear. The saltwater aboveground pool pump would eliminate any chemical usage, like chlorination in the water. This option will involve more upfront money but will yield long-term benefits in terms of family health as well as recurring pool maintenance cost. 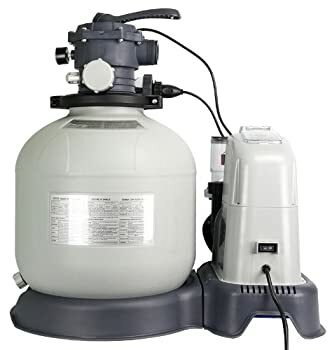 You can review above ground pool pumps for a saltwater system that suits your pool type. Final Words We hope that our review of Intex Ultra Frame pools will be beneficial for you to make an informed decision while purchasing an aboveground pool for your family and friends. We suggest you further equip yourself with more in-depth reviews in our above ground pool supplies and aboveground pool accessories sections. You can even find more hands-on articles about pool fun and maintenance in our above ground pool 101 section. We have tried our level best to help you get the most value out of your investments by making judicious and informed decisions and we sincerely hope you have a wonderful time with your kids, family and friends with the above ground pool. Like Us and Join our community on Facebook for regular and seasonal deals on above ground pools, supplies and accessories which we post from time to time. In addition to that exchange ideas and post questions about your issues and opinions on above ground pools with the community for answers and collective exchange of ideas. 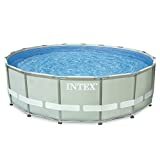 Intex Metal Frame Pool Reviews If you are looking for an above ground pool which is better than the inflatable ones yet strong and durable, then the Intex Metal Frame pool would be the rig. If you do not have a big backyard or a spacious garden with enough free space, probably you have thought that your kids will never be able to enjoy a nice bath or water-splash in a swimmin. If you are having a hard time keeping the water clean in your above ground swimming pool, then you will be happy to know that you are not the only person as there are many like you who hav.